Heinrich Schliemann (1822 - 1890), German merchant, businessman, and pioneer of field archeology. His excavations at a small hill in western Turkey were guided by Homer's epic work The Illiad, and quite possibly resulted in the discovery of the lost city of Troy. He was born Johann Ludwig Heinrich Julius Schliemann in Neubukow (Mecklenburg) on January 6, 1822, the fifth of nine children of the Lutheran minister Ernst Schliemann (1780–1870) and his wife Luise (1793–1831), daughter of the Mayor of Sternberg. Because his father had taken over the profitable parish in Ankershagen in 1823, Schliemann grew up in the village of Ostmecklenburg and lived there until the age of ten. In 1828, he received as a Christmas present Dr. Georg Ludwig Jerrer's Universal History, from whom his father read. The scene involving Aeneas' escape from a burning Troy left in his mind the possibility that some trace of the city would still exist; according to his own conclusions, this resulted in the search for the ancient city of Troy. The mother died 1831 after the birth of the ninth child, so Heinrich came to the family of his uncle Friedrich Schliemann in Kalkhorst near Grevesmühlen. For lack of money, he had to leave the Carolinum Gymnasium in Neustrelitz, which had begun in 1833, and then switched to the Realschule. In 1836 he began training as an apprentice with a shopkeeper in Fürstenberg, which he had to break off after five and a half years for health reasons. In the summer of 1841, Schliemann finally left Mecklenburg and tried his luck in Hamburg, but, despite several letters of recommendation, received only one place as a camp worker and fell ill heavily. Completely impoverished, he now thought of emigration like many of his contemporaries and took a job at La Guaira in Venezuela, sailing on the 28th of November, 1841, in bad weather, on board the Dorothea; the ship couldn't handle a gale after 10 days at sea and sank, leaving himself and other survivors stranded on the Dutch island of Texel. On the 20th of December he arrived in Amsterdam, and at the end of the year he was given a position as an accountant in the Handelshaus Hoyack & Co., and began to learn foreign languages, which seemed to him to be extraordinarily easy to learn. Within a year he studied Dutch, Spanish, Italian and Portuguese. In 1844 he became a correspondent and accountant at B.H. Schröder & Co., later Head of the Correspondence Office, and began to learn Russian, probably because of the close trade relations between his employer and the Tsarist empire. In 1846 he founded a commercial office in St. Petersburg on behalf of his company, and a year later he opened his own trading house on the Nevsky Prospekt and acquired Russian citizenship (February 15, 1847). In St. Petersburg he lodged in the palace of Count Sievers, and was already a servant. Schliemann was especially successful in the trade with so-called colonial products, namely dyes (in particular indigo) and consumer goods, as well as with industrial products. The correspondence with his brother Ludwig - who was a gold speculator in California - moved Schliemann to America from 1850 to 1852. He founded a gold trading bank in Sacramento and began to invest successfully in American rail projects. Back in Europe, he married the Russian merchant's daughter Ekaterina Petrovna Lyshina (1826-1896) after Russian-Orthodox rite on October 12, 1852, at St. Isaac's Cathedral, thus consolidating his social position. His three children from this marriage were Sergej (1855-1941), Natalja (1859-1869) and Nadeschda (1861-1935). He became very rich with large supplies of raw materials (lead, sulfur, and saltpeter) sent to the tsarist army in the Crimean War (1853-1856), bypassing the naval blockade by land. 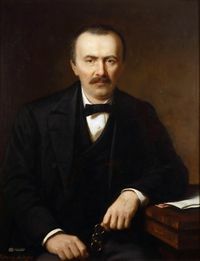 In his most successful economic year (1855), Schliemann was listed on the Petersbörse as a merchant with the highest trade turnover and a business volume of 1 million thaler. By 1856 he had learned Latin and Ancient Greek and wanted to withdraw from his business life. He succeeded only in 1864, going on extensive study trips to Asia as well as to North and Central America. In 1865 he wrote his first book, La Chine et le Japon au temps présent ("China and Japan"). With its precise, factual description, the book is a good source of knowledge of pre-modern everyday life in these two countries. From 1866 he studied languages, literature and antiquities at the Sorbonne in Paris. In April 1868 Schliemann began his first research trip to Greece. Through Rome and Naples he traveled to Corfu and sought traces of Scheria, in which the Greek hero Odysseus was stranded, and whose country was frequently equated with Corfu. On July 28, 1868, he reached Ithaca, and for nine days sought in vain for the Palace of Odysseus described in the Iliad. For the first time, he tried as an excavator and hired local helpers. He came to the Troas for the first time on August 9th and did intensive research into the presumed site of the legendary city of Priam. After long, detailed visits, he shared the opinion of Frank Calvert that Troy had to be hidden under the hill known as Hisarlik, and applied for a dig permit. In September 1868, Schliemann traveled back to Paris, where he wrote his book Ithaca, the Peloponnese and Troy, which he presented as a dissertation in the French version together with his publication La Chine of the University of Rostock in 1869. In the same year, he traveled to St. Petersburg and the United States, where he obtained American citizenship on March 29 and, at the end of June obtained a divorce from his Russo-Orthodox marriage; the marriage itself was loveless, as she had preferred her husband to settle down and engage in his business rather than be an archaeologist. At the same time, his friend Archbishop Theokletos Vimpos from Athens sent him photographs of Greek matrimonial candidates, and after his return to Greece he married 17-year-old Sophia Engastroménos on September 24, 1869, according to Greek orthodox rite in the Meletios church in Kolonos, the birthplace of Sophocles (today a district of Athens). After a honeymoon in Italy and a stay in Paris, Schliemann returned to Athens at the beginning of 1870 and bought a villa in Odos Mouson near Syntagma Square. In the same year, the Greek Philological Society chose him as a corresponding member in Constantinople. In the spring of 1870, the Turkish government had still not granted the permit, but Schliemann again went to Hisarlik, and from April 9 to 22 dug with workers a 62-foot-long and up to 9 foot-deep ditch, which already led to the discovery of several settlements. In December he undertook a trip to Constantinople and the unsuccessful attempt to obtain the permission of the Ottoman authorities by personal intercession; in those three weeks he successfully learned Turkish. On May 7, 1871 his daughter Andromache (d. 1962) was born in Athens. When he spent the summer in London to buy parts of the digging equipment, he received a letter from Constantinople on August 12, granting him permission to carry out his excavations. Back at Hisarlik, the local provincial administration acknowledged the permission only for the part of the hill that belonged to Frank Calvert, which would have prevented a total cut through the hill. After the intervention of the American Embassy in Constantinople on October 11, 1871, however, the excavation campaign could begin as planned, quickly revealing ancient, Bronze Age and Stone Age settlements until the excavations on November 24 had to be completed because of the coming winter. On the 1st of April, 1872, the second campaign began and led to the discovery of the so far most important find, the so-called Helios-Metope of the Triglyph Frieze of the Hellenistic Athena Temple. In January 1873 began the third and most successful digging campaign. Schliemann discovered a city gate, which he assumed to be the Skaean Gate of the Iliad; this led on a broad street to a house which he had interpreted as the Palace of Priam, and from where on May 31 the so-called treasure of Priam was found. Despite publicly stating that the finding of Troy fulfilled a personal dream, Schliemann was denied the desired professional recognition in Germany. Only in Great Britain did the discovery attract a great deal of attention in the professional world; The Society of Antiquaries of London invited Schliemann to a much-respected specialist lecture at the Burlington House, where he was greeted by the British statesman William Ewart Gladstone with a laudation. Heinrich Schliemann (top right) and Sofia Schliemann (seated, bottom right) at the Lion Gate, ruins of Mycenae, Greece, ca. 1884-85. At the beginning of 1874, Schliemann traveled to Mycenae in Greece to search for traces of the people and places mentioned in Homer's Iliad, and especially after Agamemnon's tomb, which he supposed to be in Mycenae. For six days, twelve of his workmen on the site had been digging a depth of five yards deep until the illegal digging (no permit was granted) was stopped by the authorities. In the same year, Schliemann was sued by the Turkish government for the surrender of half his Trojan treasures before an Athenian court; The process ended with a settlement in which Schliemann legally acquired Priam's treasury by paying 50,000 gold francs. While waiting for the permission to dig at Mycenae, Schliemann moved through Europe in 1875 to study and travel, carrying out excavations in Alba Longa (the founding of Ascanius, the son of Troyan prince Aeneas from the Iliad) and the former Phoenician Mozia. In the summer of 1876, he had permission to dig at Mycenae, so that he and his wife Sophia, who for the first time independently conducted part of the excavations, were now officially starting the extensive campaign with 63 workers. On the 9th of September, they encountered a meeting place in the Iliad, consisting of two concentric rings of upright flat, polished stone slabs with an outer diameter of about 30 meters. During excavations at this location, simple tombs and burial burials were discovered. From the end of November five magnificent shaft graves with golden masks and valuable burial objects, such as a life-size silver cow head with golden horns. On the 28th of November, Schliemann telegraphed to the Greek king that he had found the grave of Agamemnon and his family. It was not until the next day, however, that he found the largest and most artistic golden mask of the dead, known as the gold mask of Agamemnon. When he stopped digging on December 3 he had lifted 28.6 pounds of gold artifacts. These were stored by the Greek authorities in the Athens State Bank and can be seen today in the National Archaeological Museum. Among the burial items were numerous artifacts, among them Baltic amber, leading to discussions on the age, the course, and the ramifications of the trade routes between peoples settled in the eastern seas, the north of Europe, and the ancient civilizations in the Mediterranean. In November 1877, Schliemann brought his "Priam's treasure" to London, exhibited it at the South Kensington Museum for twenty-three years, and became an honorary member of the Society of Antiquaries of London. Now the scientific and public interest in Schliemann's work in the German Reich also increased. In March 1878 his son Agamemnon (d. 1954) was born. In 1878-79, Schliemann carried out new digging campaigns in Troy, where his sponsor Rudolf Virchow was present in time. In 1880-81 Schliemann dug in Orchomenos (whose people, according to Homer, took their king Ialmenos in the war against Troy) and found the so-called treasury of Minyas, the fabled founder of the city. In 1881 Schliemann donated his collection of "Trojan antiquities" to the German people, and became an honorary citizen of Berlin as well as an honorary member of the Berlin Society for Anthropology, Ethnology and Prehistory. He published his research results under the title Ilios, a book which also included his autobiography. 1882 began its sixth campaign in Troy with the cooperation of the young archaeologist Wilhelm Dörpfeld. In the same year he was appointed a member of the Bavarian Academy of Sciences. In 1883 Schliemann became honorary doctor of the University of Oxford and honorary member of Queen's College. From March, 1884, he carried out very successful excavations in Tiryns together with Dörpfeld. Sixty workers carried the rubble of the site, where as early as 1876 the Cyclopean walls had been discovered, which now proved to be the foundations of a prehistoric royal palace with a large courtyard, altar, frescoed rooms, bathrooms and megaron. The discovery of the palace gave science a profound knowledge of the extent, the flowering, and the decline of the Mycenaean epoch. In 1886, Schliemann and Dorpfeld completed the excavations in Tiryns and went to Knossos on the island of Crete to acquire a dig permit, but could not agree with the land owner for a price. In 1886-87 Schliemann, who had been severely injured, drove to Egypt to recover on a Nile cruise with his own yacht. In 1889-90, Schliemann initiated and led two scholarly conferences on Troy. After the seventh campaign in Troy, Schliemann died in Naples, Italy on December 26, 1890, the consequences of a long-standing ear cholesteatoma and the surgery meant to correct it. His body was taken by friends to Athens, where he was buried in a magnificent Neoclassical mausoleum, designed by Ernst Ziller, in the First Cemetery of Athens. In his will, he gave a special attention to his children from his first marriage, who inherited his houses in Paris, and from his second marriage, which was given to them in Greece. Documentation of everything uncovered and recovered. Through his numerous publications he has decisively promoted the interest of the public in serious archaeological research. His reports on the connections between Tiryns, Mycenae, and Crete first brought these sites into the consciousness of history. Schliemann is therefore rightly recognized as a "father of Mycenaean archeology" in specialist circles today. This page was last modified on 30 April 2018, at 09:48.